Tibetan book of Proportions shows precise guidelines for depicting the Buddha and Bodhisattva #ArtTuesday « Adafruit Industries – Makers, hackers, artists, designers and engineers! Via The Public Domain Review. 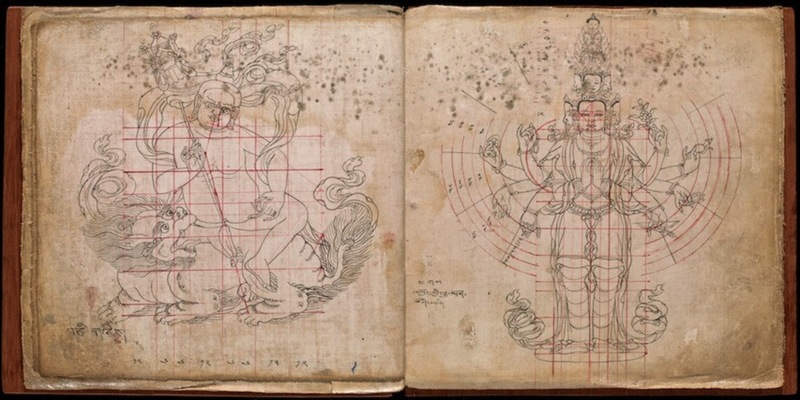 An eighteenth-century pattern book consisting of 36 ink drawings showing precise iconometric guidelines for depicting the Buddha and Bodhisattva figures. Written in Newari script with Tibetan numerals, the book was apparently produced in Nepal for use in Tibet. The concept of the ‘ideal image’ of the Buddha emerged during the Golden Age of Gupta rule, from the 4th to 6th century. As well as the proportions, other aspects of the depiction – such as number of teeth, colour of eyes, direction of hairs – became very important. The V&A have produced a good guide to the iconography of the Buddha, including the 32 Lakshanas or special bodily features.